A few days ago, a new tool for memory tweaking of AMD GPUs was presented by Eliovp and A. Solodovnikov on Bitcointalk and GitHub and it already got a synonym “ETH Pill for AMD”. What makes it different from OhGodAnETHlargementPill though, is the fact that every parameter can be set manually - which can be perfect for those miners that like to fine-tune their GPUs, but not suitable for beginners. For now, AMD Memory Tweak is only available for Linux* and we have implemented it to our Linux mining OS just two days after the first public release. 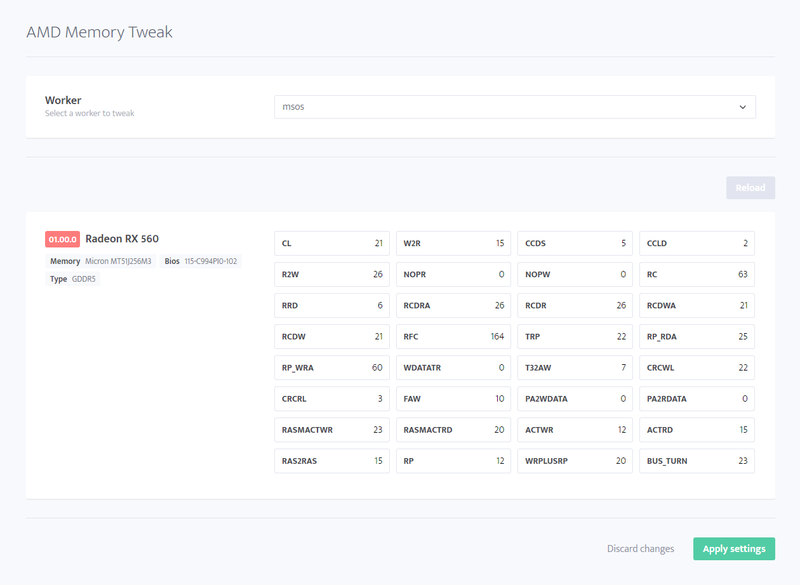 Today, we have extended the ability to use AMD Memory Tweak and set the parameters directly from your minerstat dashboard. *At the time of the writing AMD Memory Tweak was available only for Linux, but you can find Windows version now as well. You will still be able to connect to your rig through the console and see the current values by entering amdmemtool --current or enteramdmemtool --help to see all available commands and to set custom parameters. AMD Memory Tweak settings can be applied only to the online workers for which we can see available GPUs. You will be able to apply every parameter for every GPU, regarding the GPU type (HBM2 or GDDR5). When you open the tool for the first time, the parameter values from your GPUs will be loaded. Right after you apply your first settings, the values will be saved to the database and read from the database whenever you load the tool and whenever you reboot the rig (this tool by default resets the values on reboot and with msOS you won’t have to worry about losing them). In case you want the values to be read from the GPUs again, you need to press the button Reload. This will remove the values saved in the database and allowed you to re-set everything up. 💡 Hint: If you have entered settings that were too much for your GPU and it crashed, first click Reload to clear the database, and then reboot your rig to load default parameters. Since the tool is still fairly fresh, there isn’t much information available on which parameters will give you the best results. We will, however, collect the sources where you can find more information and listed them here. Since fine-tuning takes a lot of time and dedication, we also suggest you take some kind of notes to not lose the settings that gave you boost and the settings that were too much for your card. To use AMD Memory Tweak on your AMD GPU rigs, register a new account on minerstat.